Cristobalite is a crystalline form of silica (SiO2). Silica has the rather amazing ability to exist in different crystalline forms (called polymorphs) each of which has subforms (e.g. alpha, beta). Each form has different physical properties. Quartz in the preferred most stable form, the one found in nature. Quartz can be industrially converted to cristobalite using a calcining process and these much more expensive cristobalite powders and aggregates are used in a variety of products and industries (but not ceramics). We encounter cristobalite in ceramics because clay bodies almost always contain plenty of quartz particles that can convert to cristobalite during firing if the conditions are right. The extent to which this conversion takes place has an important effect on the body: It creates a new and lower inversion temperature. 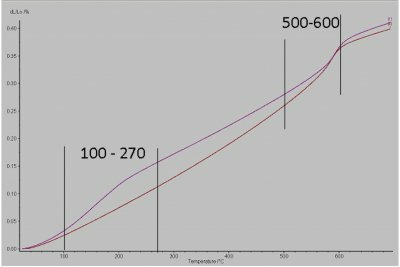 Quartz has one physical property that is a bane in ceramics: A sudden 0.5% increase in volume change as it is heated up through a narrow 50C window of temperatures centering around 550C (it contracts by the same amount as it is cooled through this temperature). Cristobalite, not to be outdone, does the same thing but at a much lower temperature and more suddenly (0.8% change in 30 degrees C centering around 200C). 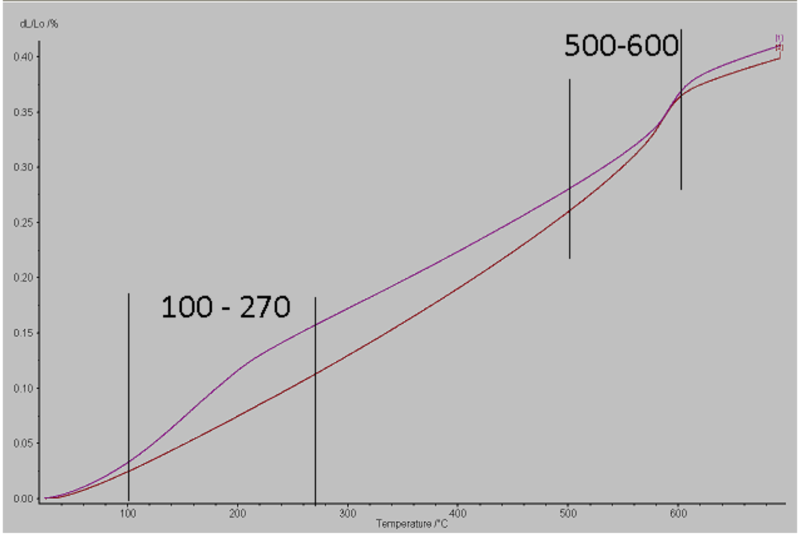 While many books and references state that cristobalite inversion happens at 220C, an examination of a graph of its expansion vs. temperature (see link below or google images for the term "quartz vs cristobalite inversion") shows that it is alot more complicated than that. Cristobalite begins expanding suddenly right from the start, the rate of increase accelerates to a near vertical line, then drops off to a much slow rate of increase. Given that ceramic is brittle, sudden volume changes are certainly not ideal. For this reason the presence of cristobalite can be menace because its side effects make the body susceptible to dunting in the region of volume change (cooling cracks, cracking during use due to sudden cooling). This is not something you would want in a flameware body! Cristobalite forms spontaneously (within bodies) at temperatures above 1100C from very fine quartz found in some clays, from finely ground silica powder and from molecular silica liberated during the formation of mullite from kaolin. If feldspar is present in the body then any available molecular silica is taken up in the formation of silicates, and thus cristobalite does not form. Even if it does then it too is taken into solution. A good cristobalite-avoidance strategy in formulating a body is to use enough spar or naturally fluxed clays to be sure that any potential cristobalite is drawn into body glass (check with dilatometer test) and then re-establish fit with fine quartz. In this way quartz is compressing the glaze at 573C rather than cristobalite at 220C. A typical cone 10 porcelain with 25-30% feldspar will show no evidence of cristobalite on its expansion curve (as measured in a dilatometer). Conversely, high iron often non-vitreous stoneware bodies can generate high cristobalite levels. Cristobalite is considered beneficial by many since the sudden contraction that occurs squeezes the glaze and thus prevents crazing. By careful formulation, choice of silica particle size and firing curve, a much great quartz-to-cristobalite conversion will take place. A classic way to recognize a raw material (e.g. a ball clay) that forms significant cristobalite on firing is to note any significant shivering that occurs with a typical stoneware glaze. Some clays generate so much cristobalite that they will literally shed all of their glaze during final stages of cooling. Contrary to what was already stated, it can be added as a raw material to earthenware bodies, improving craze resistance after glazing (because of the sudden contraction puts the glaze into compression). Talc contains mineral species that, when added to earthenware bodies, act as a catalyst to the natural formation of cristobalite. This approach is necessary in low temperature ware because quartz inversion temperatures typically find glazes still somewhat fluid, having not reached their set point (quartz inversion is used to advantage to put high temperature glaze in final compression). Notwithstanding this, the natural thermal shock resistance of earthenware could be lost by employing this strategy.